Question: why has Obama’s response to the genocidal conduct in Libya by dictator Gaddafi been so extraordinarily weak? Remember as a kid drawing connect-the-dots pictures? Simply follow the dots and a clear picture emerges. As an adult, connecting the dots of Obama’s actions leads to an oxymoronic picture. A clear picture of a murky web. Obama’s actions continually link him to people and causes that the majority of Americans do not support. The recent event of another aid ship sailing to Gaza is an example of to whom and what the strands of Obama’s web link him, and unfortunately America. Last year, right around the time Libyan dictator Muammar Gaddafi called Obama “our son,” Obama earmarked $400,000 for two Libyan charities. The money was divided between two foundations run by Gaddafi’s children; Gaddafi International Charity and Development Foundation, run by his son Saif, and Wa Attassimou, run by his daughter Aicha. What noble causes did our tax dollars potentially help support thanks to Obama’s generosity? Funding of the ship Amalthea: The Amalthea sailed to Israel with the intent of breaking the Israeli blockade on Hamas. It carried aid for a pseudo humanitarian crisis and supporters who were said to be “keen on expressing solidarity with the Palestinian people in the plight amidst the siege imposed on Gaza.” The ship was funded by Saif Gaddafi’s charity, Gaddafi International Charity and Development Association. Obama’s friend, Bill Ayers, joined attempt #1 against Israel’s blockade on Hamas. Saif joined attempt #2. One has to wonder which of Obama’s friends will step up to the plate at attempt #3. The release of Lockerbie bomber Abdel Baset al-Megrahi: Saif Gaddafi was involved in negotiating the convicted bomber’s release, and accompanied him back to Libya, where al-Megrahi was praised and welcomed. For those who have forgotten the extent of the carnage of the Lockerbie bombing, 270 people, including 189 Americans, were killed. What a web Obama continues to spin. One can only hope he falls into it soon, before all of American is smothered by it. As pressure mounts on the White House to intervene to stop Moammar Gadhafi’s bloody crackdown in Libya, many commentators have been wondering why Barack Obama has been cautious in his criticism of the dictator after the U.S. president so fervently supported the removal from office of U.S. ally Hosni Mubarak of Egypt. But Gadhafi has been tied to Rev. Jeremiah Wright, Obama’s spiritual adviser for more than 23 years. The Libyan dictator also has financed and strongly supported the Nation of Islam and its leader, Louis Farrakhan. Obama has ties to Farrakhan and his controversial group. Read more at wnd.com. 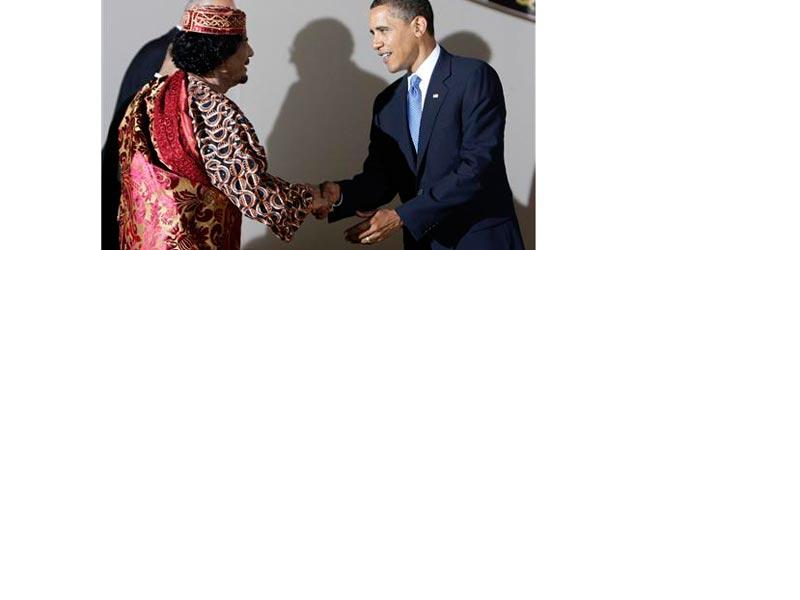 Libyan leader Muammar Gaddafi considers the US president a blessing to the Muslim world. In a speech published in London-based al-Hayat newspaper on Saturday, Gaddafi praised Barack Obama, called him a “friend” and said there is no longer any dispute between his country and the US. He said, “Now, ruling America is a black man from our continent, an African from Arab descent, from Muslim descent, and this is something we never imagined – that from Reagan we would get to Barakeh Obama.” Read more at ynetnews.com. RUSSERT: What do you do to assure Jewish-Americans that, whether it’s Farrakhan’s support or the activities of Reverend Jeremiah Wright, your pastor, you are consistent with issues regarding Israel and not in any way suggesting that Farrakhan epitomizes greatness? Only four percent of Jewish Israelis believe President Obama’s policies are pro-Israel while half oppose a temporary freeze of Jewish settlements in the West Bank, a poll released on Friday found. The survey, conducted by the Jerusalem Post, found that more than half, 51 percent, considered Obama’s administration to be more pro-Palestinian than pro-Israeli, up slightly from 50 percent in June. The percentage of Jewish Israelis who consider Obama to be pro-Israel was down from six percent in a much-cited June 19 poll. By comparison, 88 percent of those interviewed in the June survey thought former President George W. Bush was pro-Israel. And there is frankly more than that. All I know is Obama is carrying so much baggage he should be working as Gaddafi’s porter. Obama was late criticizing Egypt’s Mubarak. He had his vice president go out and say, “Mubarak isn’t a dictator.” And only began to criticize Mubarak when it was obvious that that was where the wind was blowing. And then he said Mubarak’s name over and over and over again. Obama has yet to specifically mention Muammar Gaddafi by name. Even as the man massacres his people by the thousands.